Given the recent talk of American investment, if there's ever a rebrand, maybe the name will get changed to '10 man Swansea' as it seems to have been in use a lot so far this season. I like Jonjo, pretty much everyone likes Jonjo but he really drives you crazy at times. Even ignoring Saturday's red card there was an incident in the game at Leicester which I felt summed up the negative part of his psyche. A Leicester play drove into the box and either stumbled (if you're being generous) or made a weak attempt at a dive, play then continued just outside the box and Jonjo couldn't resist having a dig, giving away a free kick in a dangerous area and standing over his opponent furious at what he felt was an attempt to con the ref. Overall this was a great point even if it does maintain the stat that Swansea against Everton is the longest playing streak between two league times without a win which now stands at Swansea's 19 league games without beating Everton. Although Bony's early chance was arguably the best opportunity of the game, shot wise Swansea offered relatively little with Roberto grumbling a bit that he expected a bit more of an open contest although to be fair to him he did praise the way Swansea defended. Swansea with only 3 shots in the last 70 minutes and none after Shelvey's red. 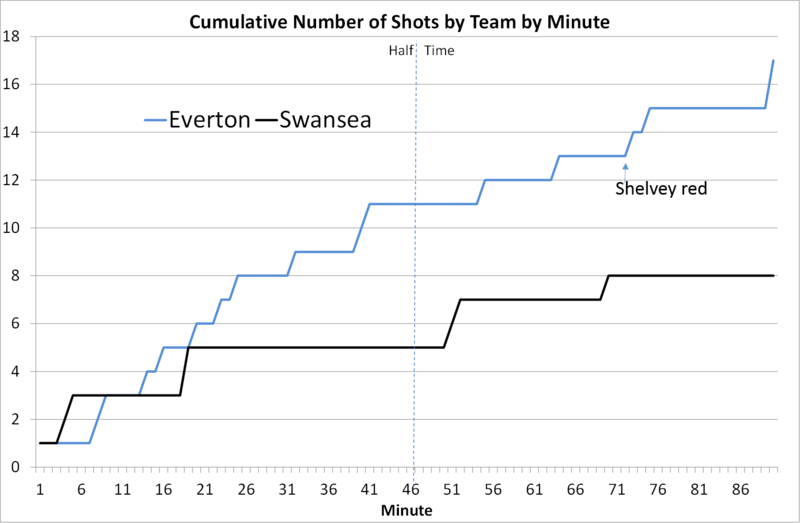 There were a flurry of efforts from Everton immediately after the sending off and also within injury time, but it's impressive to see generally a flat line of Everton chances over the last 20 or so minutes of the game. 5 Clean sheets in 10 league games is something to be proud of but at the other end having around half as many corners as any other side and only Villa having fewer shots per game are things that might cause a little concern, although given we're 6th after 10 games I'm not going to get too worked up about them. If you're interested in watching the game again, Everton do a good service on their website where you can watch a 3, 5 or 20 minute highlight version, you need to register but free to watch.